I am very proud to announce to all members that our State Show this year was a complete success. We have received very positive feedback – it truly was a great show!! Thank you to the CCHS committee who gave a lot of time and effort in organising the show and spent the whole weekend ensuring all went smoothly. Thank you to Janine Harris for donating the treasured prizes for the Supreme Clydesdale and the Max Fowler Award. Thank you to Sue-Ellen Kiesling for undertaking an excellent job as ring Steward. Supreme of Supreme Heavy Horse was awarded once again to the amazing Tierney Park Minstrel generously sponsored by Doral. 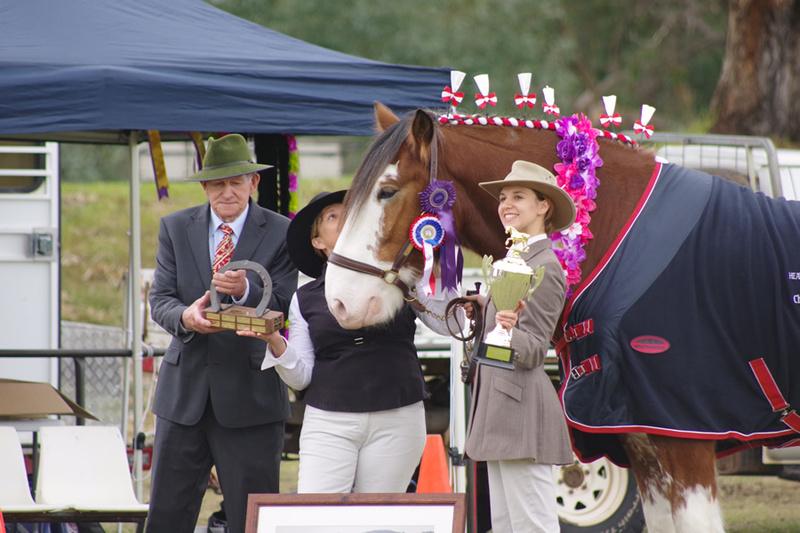 Supreme Clydesdale Exhibit was awarded to Valmont Dynasty, owned by Mrs Skye Coffee, sponsored by Austin Borsi, Janine Harris and Trophy by Redbrook Clydesdale Stud. The Max Fowler Gelding Trophy was awarded to Benwerrin Flicka, handled by Aimee Deakin, sponsored by the CCHS, Austin Borsi and Janine Harris. A special “thank you” to all members who supported our show and helped to create the friendly, relaxed atmosphere that we all enjoyed!! We were very lucky to have the world-wide renowned and respected Mr Max Marriott of Aarunga Clydesdale Stud as judge at our State Show – he was kept very busy during the weekend with 50 horses to judge!! Mr Marriott undertook his duties with pride and diligence – what an amazing opportunity this was for all competitors!! Committee member, Brooke Atkinson worked extremely hard to ensure that our State Show was a success and she did an amazing job!! Huge thanks to Brooke and congratulations on her success in the show ring with her exceptional colt SP Sir James – definitely a star in the making!!!! Incredibly, Brooke had her baby just THREE days after the show!!! The CCHSWA are delighted to announce the safe arrival of Brooke’s beautiful baby daughter, Mia, and wish her well in all her future endeavours. It was wonderful to be part of a show that not only had quality horses on view but also owners/handlers who entered into the spirit of encouraging others and having fun on the day! Day two of the show was supported by local spectators who enjoyed our harness classes. Congratulations to all the harness competitors who all did a great job. Mr Walmsley won the Matilda Part-Bred Trophy and Mr Phil Lucre was the overall winner – taking home the Walter Angel, Rex Newbold and Duncan Mackinnon awards – well done Phil!! !